One of a pair charming needlecases all of which are encrusted with beads and with a tassel. 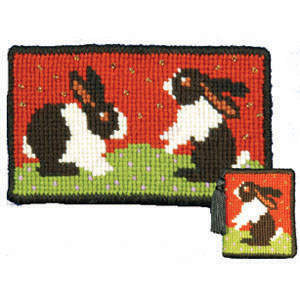 The kit uses Anchor tapestry wool on 10hpi canvas and measures 6" x 3" (15.25 x 7.5cm). Contents: Canvas, wool, black and white symbol chart, full illustrated instructions and two needles, beads, tassel and felt for making up into a needlecase.